The South Barn, Pool Crook Farm, Arthington Lane - £799,950. 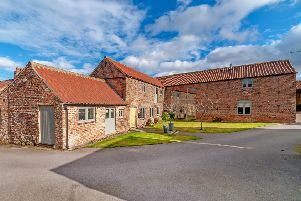 The South Barn is one of five exclusive properties in Pool Crook Farm off Arthington Lane. The property has 2,107 square feet of living space and a further 202 square feet of garage and storage space as well as private off street parking. It includes modern kitchen, under floor heating, sitting room with polished wooden floors, entrance hall, garden terrace, cloakroom WC, utility room. The property has fishing rights to the nearby River Wharfe. Contact Strutt & Parker www.struttandparker.com.